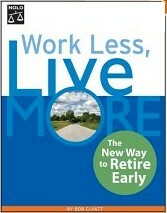 Retire Early Book Review -- Work Less, Live More, by Bob Clyatt. This article was first posted January 1, 2006. The book begins by discussing why we work and how people come to the decision to retire early. The author illustrates points with with anecdotes from early retirees, some of whom are posters at the early-retirement.org discussion group. Chapter 2 discusses "Living Below Your Means", the time-tested strategy common to almost every "retire early" story, while Chapter 3 explains Modern Portfolio Theory (MPT) and the need for maintaining a diversified portfolio to fund your living expenses once you retire. The author uses a widely-diversified "Rational Investing" 16-asset class portfolio that includes some exotic investments categories like commodities, hedge funds, and private equity placements. Many retirees may opt for a simpler 9 or 10 asset class portfolio that can be easily and inexpensively constructed with Vanguard funds. In Chapter 4, Clyatt discusses how to safely tap your retirement nest egg to fund your living expenses. The author commissioned a study by Keith Marbach of Zunna.com where he assembled a Rational Investing Proxy Portfolio (to approximate the 16-asset class portfolio described above) and backtested it against the 78-year data series in the DFA Matrix Book 2005 using various withdrawal rates. Marbach used the "percent of year end assets" method to determine the dollar amount of the annual withdrawal. This isn't directly comparable to the "percent of initial portfolio value, adjusted for inflation annually" method used by some of the classic research in the field like the Trinity study and William P. Bengen's work. Marbach then evaluated the portfolio's ability to sustain a given withdrawal rate through the end of the pay out period with the initial, inflation-adjusted principal intact. He reported a 95.9% success rate (in maintaining the inflation-adjusted principal) for 30 years at a 4% withdrawal rate. Click here to order Work Less, Live More Today! Taxes are the subject of Chapter 5. The good news is that most retirees pay a lot less in taxes than working folks. Clyatt provides a couple of detailed examples showing why this is so. Chapter 6 reviews some of the reasons you may want to return to work and lists about a dozen things that you can do to keep busy. Clyatt himself has started a part-time custom sculpture business in retirement, building on artistic talents that he didn't know he had up until a few years ago. Chapter 7 considers the perculiar perils of early retirement; guilt, bordom, ego, and panic among them along with a few tips for couples so that they remain on the same page during retirement. The book includes with two appendices; one is a short explanation of the various asset classes, the other a list of on-line resources and books of interest to early retirees. Work Less, Live More is a worthwhile addition to your early retirement library. It's highly recommended. Copyright © 2005 John P. Greaney, All rights reserved.